Well, once again, my high school classmate, Kathleen, has sent me another fabulous recipe. She used a recipe that came with her ice cream maker, and then she added a few things to make it her own. The result? A fabulously festive treat that your family will love! I love the fact that this recipe uses egg beaters instead of whole eggs so there's no need to cook the eggs into a custard before freezing. And it's so festive! 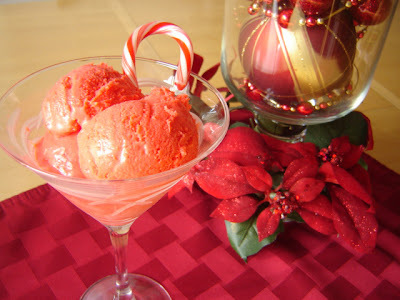 Just imagine a few scoops of this ice cream floating in a punch bowl full of egg nog. Brilliant! Thanx again Kath! And thanx for taking the beautiful picture too!! Hope you get to make some and try it for yourself! You can have fun with this because you can change up the color and the candies in it. Try Andes candies, or mini choc chips, or shaved dark choc, or even M&M's in holiday colors! We love this in our house and hope you love it, too!!! Combine eggs, sugar, vanilla, peppermint extract, red food coloring (to the shade of pink that you want) in a mixing bowl, blender or food processor. Add cream, half & half (or milk). Mix well and chill thoroughly. Crush the candy canes to the size chunks you prefer. I use about four candy canes and try not to pulverize the crap out of them. Shards are good. Powder...not so much. Follow the instructions for your ice cream maker. Mine is a "Deni" ice cream maker and it takes about 25 minutes in my machine to reach soft-serve stage. The last three minutes I pour the candy cane pieces in the top of the machine as it's running. Once done, pour immediately into a container and freeze for a few hours or overnight, until it reaches the hardness you want. Be sure to use only REAL vanilla extract, and do NOT buy the "mint" extract. MUST be "peppermint"!!! Unfortunately I found out the hard way this summer that "mint" tastes like toothpaste!! YUCK!!!!! !